KCRI is a research institute and is therefore conducting training in research. We are extensively involved in two MSc programmes offered by Kilimanjaro Christian Medical University College, which are the master of Clinical Research and the master of medical microbiology, immunology and molecular biology. In addition, we are involved partly in the other programmes. Leadership role in engaging health and development research that promotes the Millennium Development Goals. 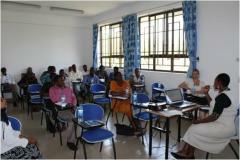 PhD candidates will be registered at Kilimanjaro Christian Medical University College (http://www.kcmuco.ac.tz/index.php/admission/application-procedures/postgraduate), but attached at KCRI for conducting their PhD training.